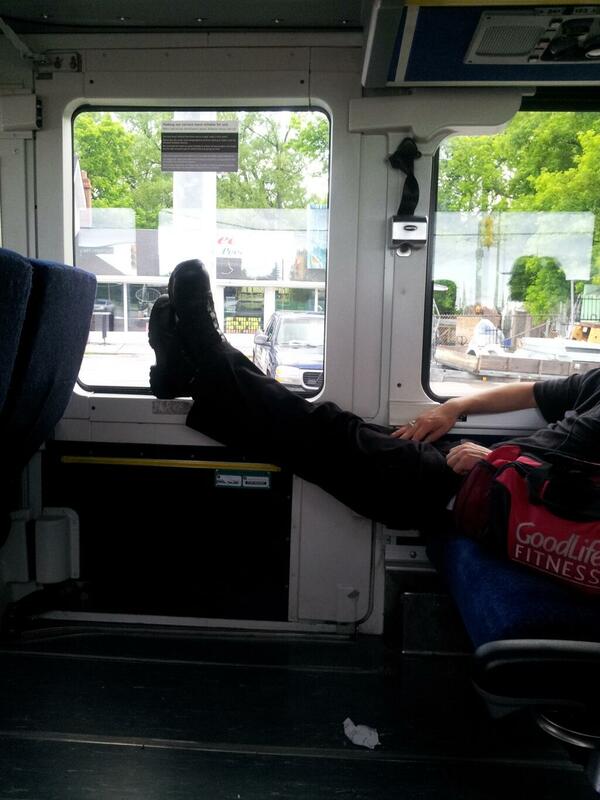 How nice that GO Transit buses provide a window ledge that doubles as a foot stool for this tool sack. Go ahead, stretch out. After all, for sure you're the entitled sod GO was thinking about when they removed the seats in the "accessible" section of their buses. That's also his litter which I reminded him to pick up when we got to the station. That ijit sure is living the "good life", isn't he? Show his face. Why so scared? You don't mind showing the faces of employees, why not show customers? A face has nothing to do with the behaviour on display. Doesn't matter. The subject is using the window ledge as a foot stool. Who cares about his face? Why do you need to see his face? To make sure it's not you? I was just wondering why you are so scared of showing faces of the people with their feet on the seats, or the plate #'s of cars parked selfishly, but you don't blur the faces of employees taking a smoke break or doing something which you consider wrong. Okay, fine, I could only find five examples of pictures you posted of employees without their faces blurred over the past two years. Sorry. I just don't understand why you blur out faces or plate #'s of people who are clearly doing something wrong, when you didn't show the same concern towards employees when it wasn't clear that their behavior was improper. Where are the links to the five examples? I don't take pictures of GO employees. I never have. Other people have but not me. You wrote "didn't show the same concern towards employees when it wasn't clear that their behavior was improper." I have NEVER taken pictures of GO employees engaged in "improper behaviour". I know there is one of a woman in GO uniform smoking on a platform but I'm pretty sure her face is blurred TO PROTECT her. I did that. This pic, though, http://www.thiscrazytrain.com/2012/08/is-it-legal-when-youre-behind-fence-in.html wasn't taken by me. My site is not about that. You better watch yourself. I take these accusations seriously. I have great respect for the people who help get me to work each day. But, don't confuse me with photos I find on Instagram and source (although I'm pretty sure I don't have photos of "bad" GO employees from there on my site). In any event, I didn't take those photos. Your beef would be with THOSE people plastering what they feel is improper behaviour over the internet. But like I said, send me your research.